Within the territory of North Wales is the fairy-tale Penrhyn Castle, which was built in 19th century in the original Norman architecture. Scattered around the palace are the fabulous exotic gardens and there you can see different kinds of tropical palms, Chinese vineyards, different types of trees, flower beds, etc. Penrith Castle is located between the National Park of Snowdonia National Park and Menai Strait, which opens to the extremely beautiful view. The history of the castle began more than 100 years ago as a demonstration of the high position in a noble family, and today the property is owned by the National Trust for Wales. Penrhyn is located just one mile east of Bangor. About 14 miles northeast is the town of Conwy, where you can visit the medieval Conwy Castle. The Norman castle architecture of Penrhyn is located on the port the same name. 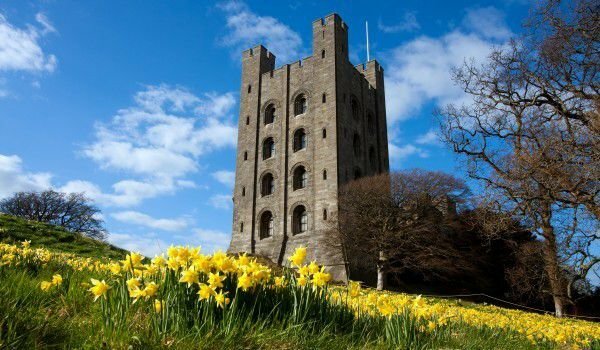 11 miles southwest is Caernarfon Castle, and just 5 miles east is Abergwyngregyn Castle. The site of Penrhyn Castle today was already settled in the Middle Ages. In the 15th century it was transformed into a palace of stone. The building was then located within a square courtyard, where the chapel was also located. Today, this old building at Penrhyn Castle has retained only the original spiral staircase and some parts of the basement. Penrhyn Castle was erected by the Pennant family and especially by George Dawkins Pennant. The family accumulated a huge wealth on the back of slave labor dealing with sugar from Jamaica and quickly troupe enviable capital. As a result, Pennant erected the castle between 1820 and 1845, the interior design resembles a beautiful and majestic cathedral, symbolizing the enormous possibilities and high social status of the family. Penrhyn Castle was built by the design of Thomas Hopper, who converted the old fortress beyond recognition and creates a true masterpiece, described as a successful attempt for the revival of Norman architecture. In the vast high tower of Penrhyn is located accommodation. Throughout, the interior is decorated with generous wood and stone carvings. Penrhyn fully recreates the medieval atmosphere which was actually built over about 180 years.